Renowned instructor and Renzo Gracie Black Belt, Karel "Silver Fox" Pravec presents a unique submission focused approach to Brazilian Jiu Jitsu geared towards the less athletically gifted practitioner. 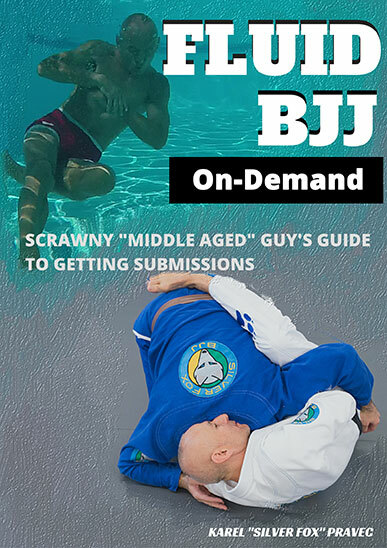 As the video complement to his book Fluid BJJ - Scrawny "Middle Aged" Guy's Guide To Getting Submissions Karel helps you navigate through some of the highest percentage/most common submissions and follow ups in both gi and no-gi Jiu Jitsu. Every technique and drill in this series is applicable to all skill levels, sizes and ages. "One must never be entirely comfortable at what he has achieved. This is the truth behind every great Jiu-Jitsu teacher... Karel Pravec is always improving his game and his knowledge of the art... He knows that to do otherwise is to settle. I salute you my fellow Black Belt. Excellence among us, it's a must... Our students deserve the best of us. Thank you for belonging to our tribe. Karel Pravec is among those unique people; lucky are those who learn under his tutelage." "Karel is one of my favourite training partners. The insights in his book are excellent to learn many techniques for advanced martial artists." "I&apos;ve been training with Fox since I was a Blue Belt. His Jiu-Jitsu is pure efficiency and has been an instrumental part of the Tristar Gym curriculum. In his book, he not only teaches a variety of powerful techniques, but he also includes pool workouts/techniques. The pool workouts, in my opinion, hit three birds with one stone. 1st it&apos;s therapeutic, 2nd it increases your fitness level, and 3rd it makes your technique instinctual. Drilling is the key to success, but comes at a price: it taxes the body. Fox has found a brilliant solution." "Back in the early 1990s, Karel was one of my first training partners in the early days of the Renzo Gracie Academy. We came up the ranks together and now that we are both long time Black Belts, I frequently ask him to visit my school to teach the professional class. I cannot say enough good things about his technique and teaching methods. I highly recommend the book!" Karel Pravec shares some great fluid routes to get the move he is showcasing. The followups to guillotine and Anaconda are awesome! He also shares some key concepts with the shoulder pressure, windshield wiper and Underhook to stress the importance of fundamentals. This is a great addition to the library and plenty material to study for the novice or competitor. This book has added to my progression as a BJJ student. There was a time as a blue belt where I felt that I stalled a bit. I was hard to submit, but at the same time, I wasn't getting submissions. When I was in a position to submit, I would sometimes try to force the action, ultimately wasting the opportunity. This book was such a help in chaining attacks and keeping efficient transitions. I still use it as a reference. Every few months I come back and choose a set that I would like to mix into my game. My submissions have increased dramitically!